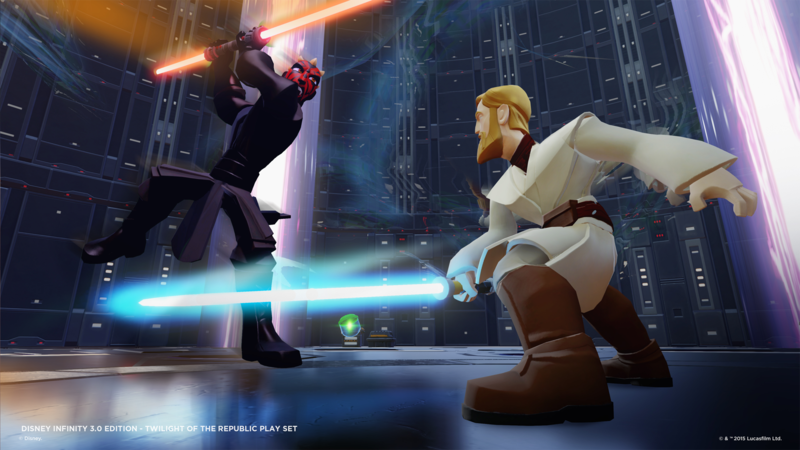 It only takes a few seconds of swinging around a lightsaber to feel the influence of DmC and Heavenly Sword developer Ninja Theory in Disney Infinity 3.0. Once you start swooping enemies up into the air with your lightsaber, slashing them several times with an aerial rave combo, right before finishing them off with a force pull and then follow up force explosion, it almost starts to feel like you're playing DmC-lite, only a family friendly version and with beloved Star Wars characters. 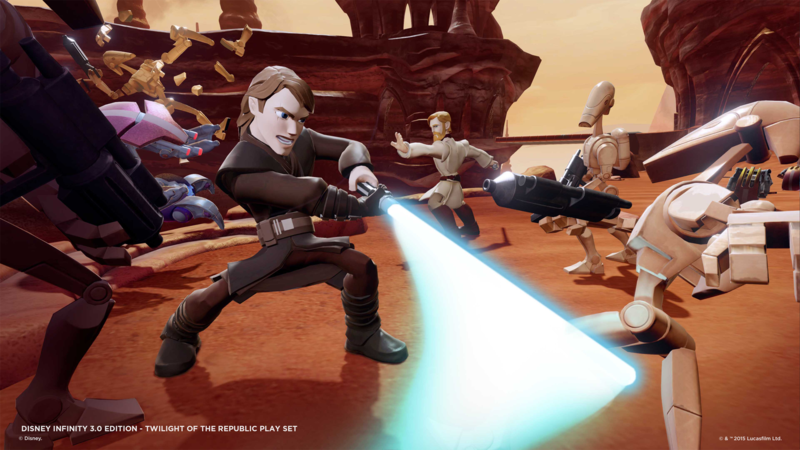 Lightsaber combat and force mastery are the core focuses of Twilight of the Republic, the first of three Star Wars themed playsets planned for Disney Infinity 3.0 which is why it makes all the sense in the world for it to be the one that is co-developed by Ninja Theory and Avalanche Software. "The goal with the team back at Ninja Theory was not just to make a great Star Wars playset, but to also really improve on the core melee combat inside Infinity as a whole," said Stephen Stanyon, game director at Ninja Theory. "We worked really closely with Avalanche to overhaul the combat system inside Infinity to make all weapons based combat to feel faster, more fluid, more responsive, and have added depth." 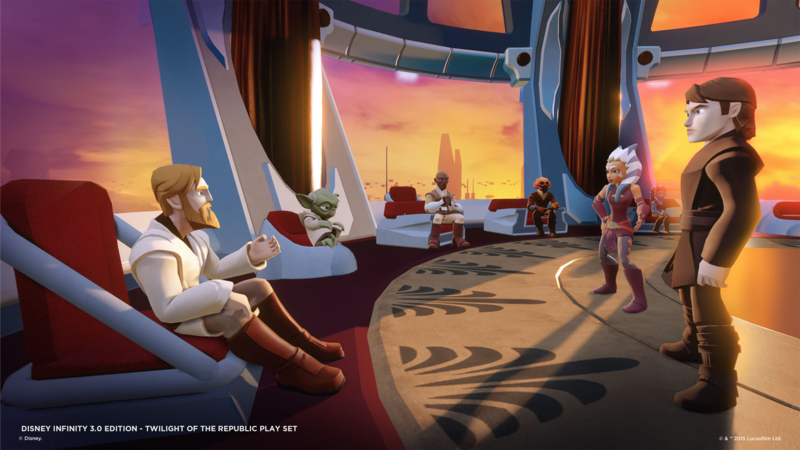 The Twilight of the Republic starter playset will ship this fall with two figures, Anakin Skywalker and Ahsoka Tano, with Yoda, Darth Maul, and Obi Wan available seperately at launch. As you'd imagine, each character has their own distinct style with unique attacks and force powers. 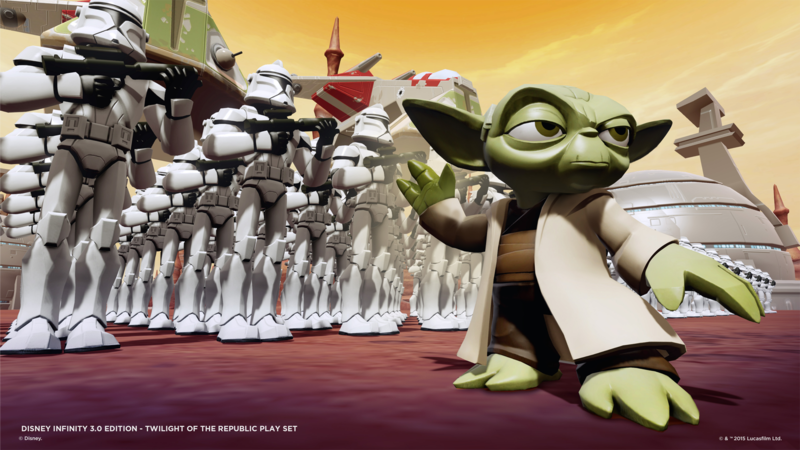 Yoda, for example, has a special ability that lets him dash to the nearest enemy, allowing him to quickly bounce from enemy to enemy, leaving heaps of droid parts in his wake. 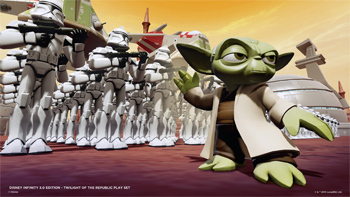 In addition to Yoda, Ahsoka fights with dual lightsabers and has moves that are designed to hit multiple enemies at once; Obi Wan has the ability to force push and has a fighting style that looks much more technical and refined than the others; Darth Maul uses his trademark dual edged lightsaber; and Anakin fights with a very aggressive style, using force pull much in the same way Dante would use his Demon Pull in DmC. 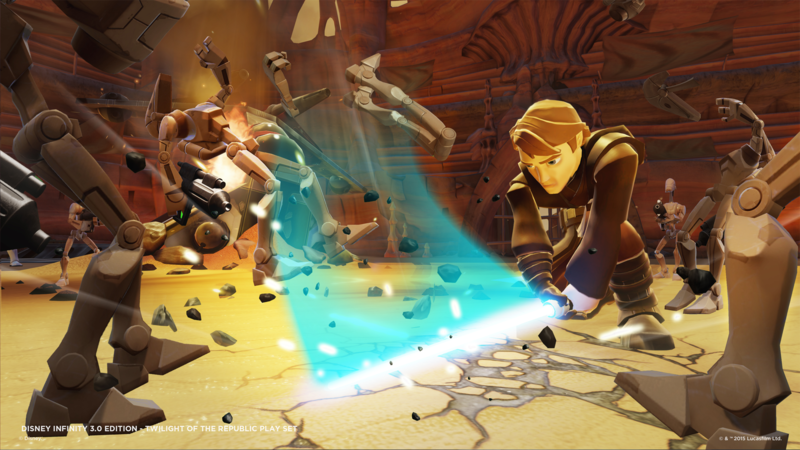 To get into specifics regarding the combat system, it actually remains very similar to how melee focused characters controlled in prior Disney Infinity games. The main difference is in how the flow of the combat actually feels. Sure enough, melee combat in Infinity 3.0 feels far more responsive than it has in previous titles. New to the combat system is the addition of air combos, which are performed by simply holding down the attack button to uppercut your enemy up into the air, allowing you to execute a couple of slashes before knocking the enemy away. The main use for bringing an enemy up into the air with you though, is to execute a devastating aerial finisher, like Anakin's aforementioned force pull/explosion. 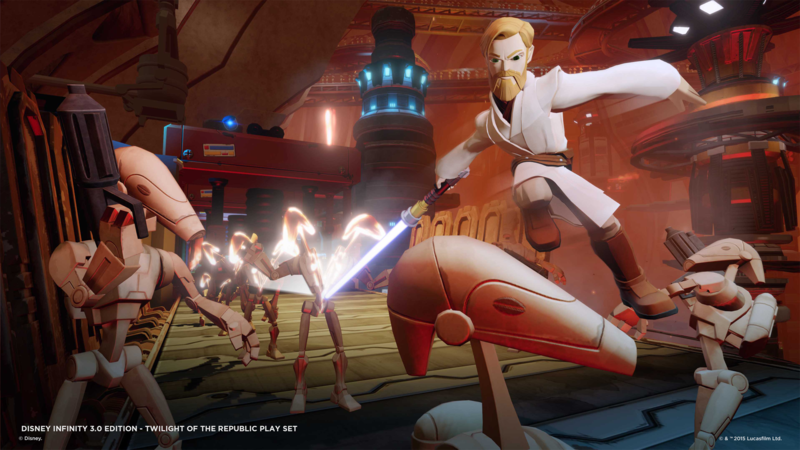 It's also worth noting that the improvements to the melee combat system are not limited to just the Jedi. Any character that wields a weapon in their hands will benefit from these improvements in Infinity 3.0. 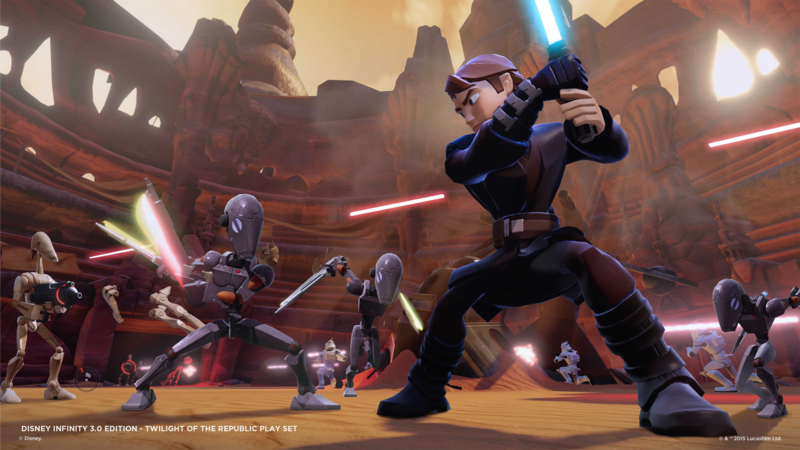 The story in Twilight of the Republic takes place during the Clone Wars era, as established by the animated series of the same name, and will see players traversing open worlds on Tatooine and Coruscant, battling droids on Geonosis, and eventually making their way to Naboo. 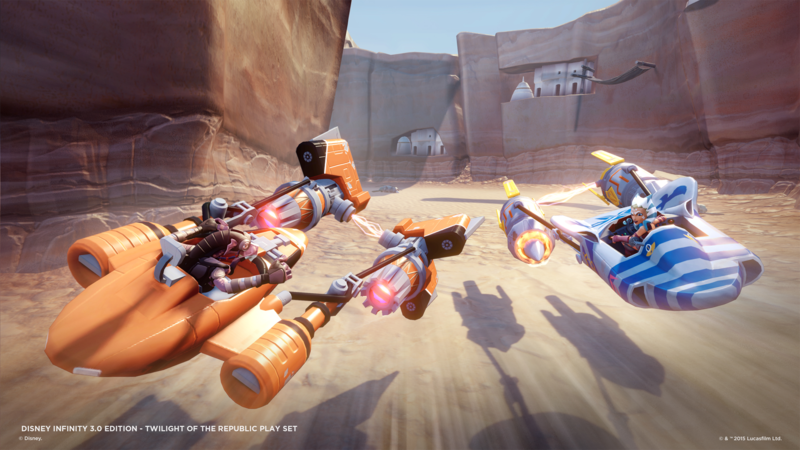 While I was only able to play through a combat focused demo on Geonosis, rest assured that there will be space travel to get you from planet to planet along with podraces to break up the action. 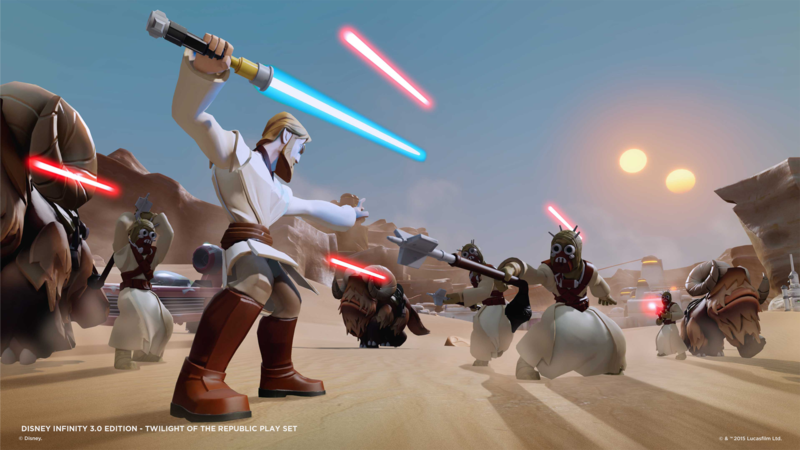 As someone who only dabbled into Disney Infinity 2.0 at a friend's house, and as a huge action game nut, the added depth in the lightsaber combat was exactly what I needed to get me interested in Disney Infinity 3.0 It's worth mentioning that the price of the Twilight of the Republic playset is $64.99, a full $10 cheaper than prior playsets. 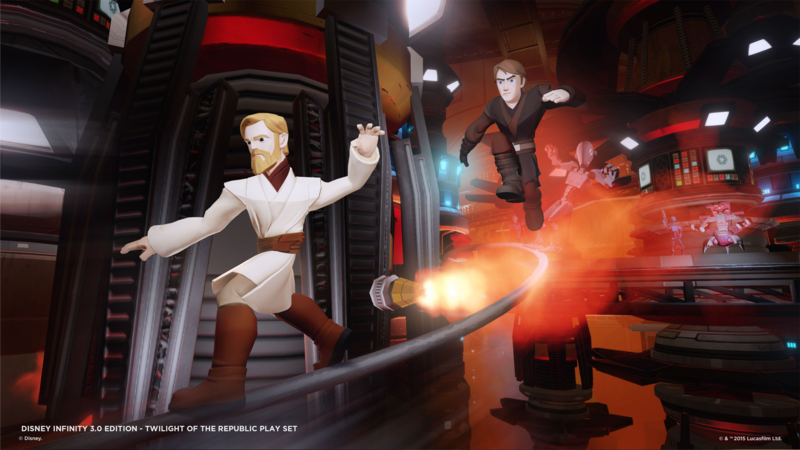 We'll have more on the second Star Wars themed playset, Rise of the Empire, as well as the playset for the Pixar Film Inside Out in the next couple of days, leading up to E3.